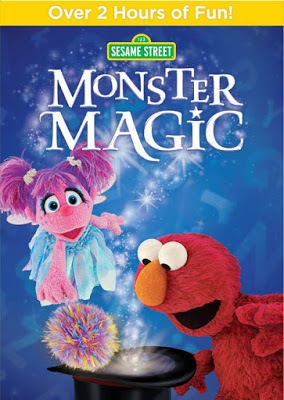 Holiday Contest and Sweeps is pleased to have opportunity to announce the New Release from Warner Bros. Home Entertainment, Sesame Street: Monster Magic This two hour DVD will provide your child two hours of pure entertainment joy. Sometimes magic doesn’t turn out like you think it will, but through fun mishaps, it can help kids learn about critical thinking, problem solving and task persistence. In Sesame Street: Monster Magic Abby, Rosita, and Zoe celebrate the amazing number 7 by conjuring up “The Dance of the 7 Chickens,” some spell-binding tricks, and even 7 Elmos! Then, Abby poofs Leela into the perfect party outfit with a magical game of dress-up. Along with their Sesame friends, kids can also learn about numbers, counting, emotions, friendship and using your imagination. Fans can also enjoy some spectacular bonus features including a Claymation titled “Bert and Ernie’s Great Adventures: Magicians,” a printable “Elmo’s Magic Mix-up” storybook, and the Amazing Mumford Rabbit Trick clip. Plus, fans won’t want to miss Grammy-Award nominated singer songwriter, Sara Bareilles’ rendition of “Just Like Magic.” The special provides more than two hours of fun with everyone’s favorite furry red monster and his friends! Now in its 46th season, Sesame Street is the longest-running program in children’s television and the number one top-of-mind preschool show with moms.Sesame Street also has the highest “co-viewing” experience – meaning adults watching with kids – of any preschool show. The series has received more Emmy awards than any other show in television history, as well as a Lifetime Achievement Emmy Award honoring the 40th year. The DVDs main feature includes two street stories (“Tribute to the Number Seven” and “Abby Tries and Tries Again“). Previous post: Its almost time for Christmas Lights! Next post: FabFitFun Fall Box Giveaway!